Members of the Dairygold Sales & Marketing team travelled to Shanghai last week to attend Food Ingredients China (FIC). FIC is Asia’s largest food ingredients show. The event ran over three days from the 24th to the 26th of March in the National Exhibition and Convention Center in Shanghai. FIC 2017 showcased more than 1,400 industry-leading domestic and overseas exhibitors. It attracted tens of thousands of visitors to the show on its twenty first year since its creation. Dairygold has a longstanding history of attending this exhibition in conjunction with our Chinese agent and distributor, Beijing Milky Way. This is an exciting time for Dairygold in Asia. FIC provided an excellent opportunity to showcase our premium dairy food ingredients, naturally sourced from the Golden Valleys of Ireland. 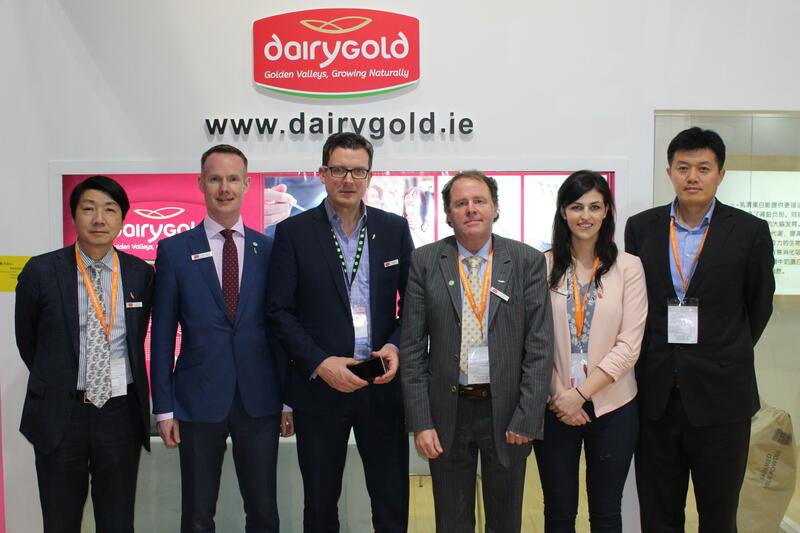 Dairygold team members pictured at FIC Shanghai last week. Pictured L to R : Steven Zhu,Market Development Director Asia,Conor Galvin Head of Commercial and Business Development, Mark Keller Head of Sales & Marketing, Kieran Evans Business Development Manager Asia, Alice Quirke Sales & Marketing Graduate, Mr Quanyu Wang Vice General Manager Beijing MilkyWay.